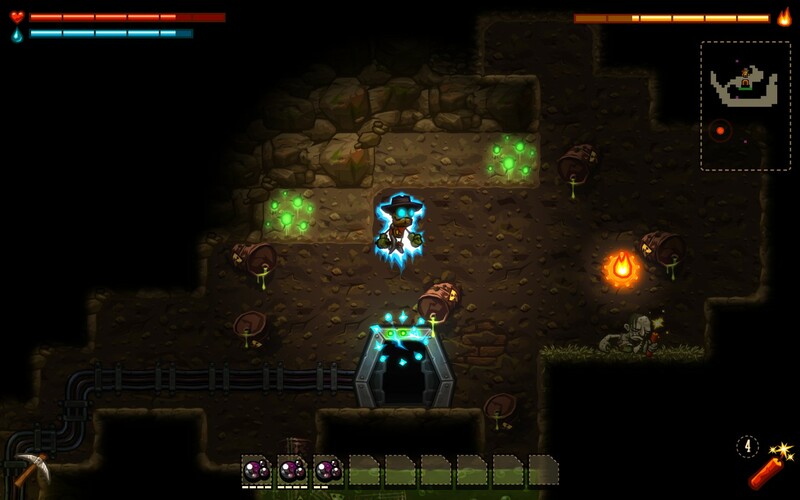 It’s essentially a game about digging. At its core is a basic and satisfying feedback loop – you dig, you find gems, you sell the gems in town, you use the money to upgrade your tools, your upgraded tools let you dig deeper and find more valuable gems. On paper, it sounds like a repetitive grind, but it’s quite the opposite – it has a brilliant momentum to it that keeps its formula feeling fresh right to the end. You play a robot, Rusty, who has inherited his Uncle’s mine and is digging down to discover its secrets. It plays like a 2D platformer, but with a focus on exploration, and with an environment that, pickaxe in hand, you are able to smash your way through at will. 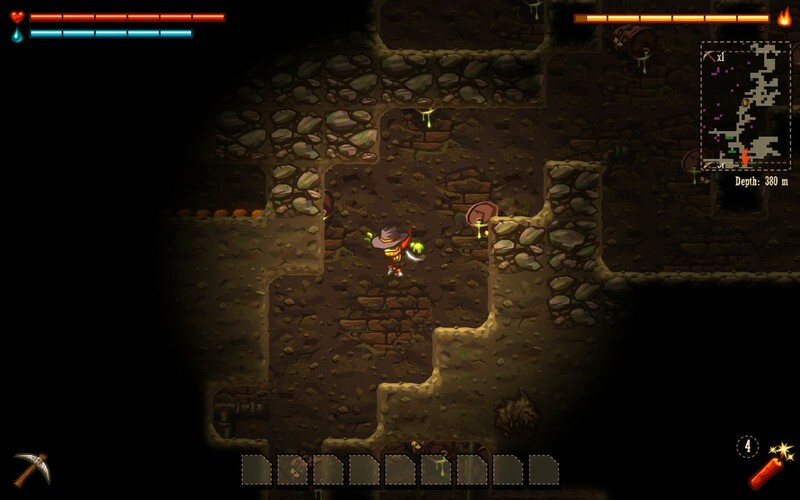 There are shades of the excellent Spelunky here, and while it’s not nearly as brutal, it does have some of that same sense of exploring and overcoming a hostile world. There are elements of the ‘Metroidvania’ in there too – as you explore, you discover new abilities that allow you to progress further and overcome new challenges. Overall it strikes a great balance – it’s just tricky enough to be satisfying, without ever becoming frustrating, and regular unlocking of new powers adds variety without ever being overwhelming. There’s a constant drive to keep moving forward – or rather, downward. Despite the back-and-forth nature of running between the mine and the town, there’s a breezy pace to the game that will have you racing to the next objective.. There’s no need to obsessively chase every possible gem either – upgrades come thick and fast, such that no trip back to town ever feels wasted. You can always afford something new, and you’ll be eager to get back out there and try it out. The art design supports this momentum perfectly. Before you can get bored with your current environment, you’ll find yourself in a new one, with a whole new look. It keeps the exploration interesting – it feels like there’s always something new to see around the next corner. It’s got a great style overall in fact, with chunky, cartoon visuals and undeniably charming character designs that just ooze personality. 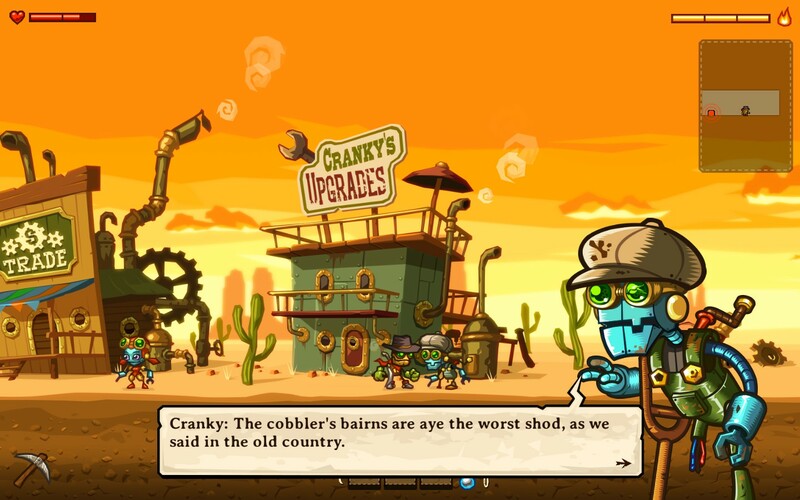 SteamWorld Dig is set in a world where steam-powered robots appear to be the predominant (sort of) life-form. While the setting doesn’t feel that original, it’s presented well, with visual cues and incidental dialogue fleshing out the details rather than big chunks of clunky exposition. The actual story feels like it mostly takes a back-seat – it’s solid enough, but pretty bare-bones, and for the most part you’ll find yourself pushing forward more to see the next cool bit of gameplay, rather than the next story beat. It takes a back-seat – but it’s appropriately written for that role, keeping dialogue short and sweet, and characters simple. 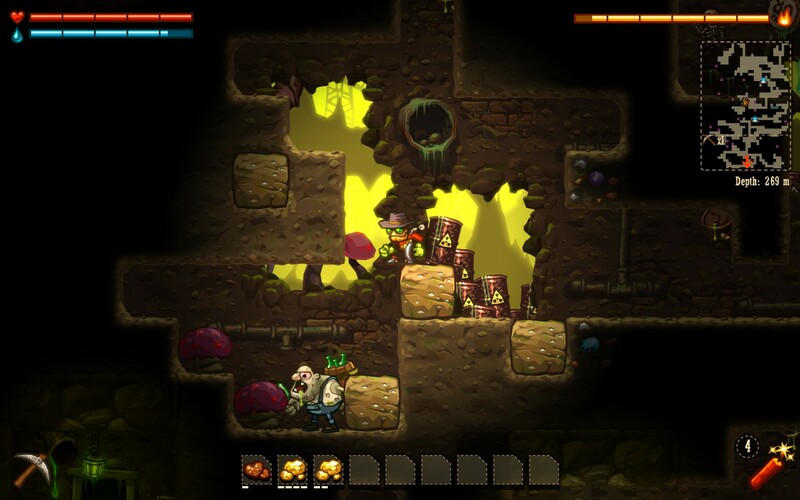 SteamWorld Dig is a little short, but for the 4 hours or so it takes to complete, I was hooked. It takes simple concepts and executes them flawlessly, and makes what could have been a mindless grind into an engaging and seriously fun experience. It’s tight and focused, and at the same time utterly charming – it’s fantastic to see a game like this make the unusual transition from handheld to PC.